Vintage 1960 photograph of Ferrari 250 GT SWB Bertone S/N 1739GT. 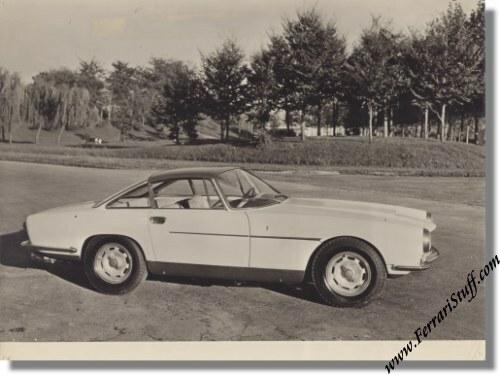 This is a vintage 1960 Bertone press photos of one of the very few Ferrari's for which Bertone designed the bodywork. It shows the car in its original 1960 guise which also shows some details which have changed over time (3 lug spinners instead of 2 lug spinners originally, details of the chrome side trim, side markers etc.). The car was originally built for the Geneva Salon of March 1960 and survives to this day in Mexico. The photo measures some 24 x 18 cm or 9.5 x 7 inches. 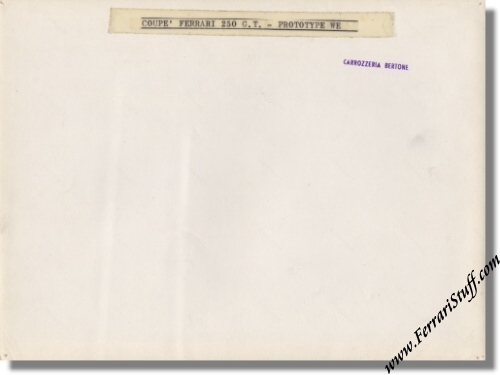 It is in excellent condition and carries the Carrozzeria Bertone stamp + a short caption on the back.